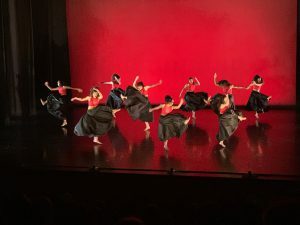 On Friday, Feb. 1, UJIMA featured Bryan Smith ’21 in a performance of “Ella’s Song” at the Fergusson Dance Theatre in front of a standing-room-only audience. Courtesy of Monericka Semeran. On Friday, Feb. 1, Vassar’s Africana Studies Program celebrated its 50th anniversary by showcasing a variety of creative student endeavors, including spoken word, poetry, dance, live music and visual arts. Like many educational institutions, Vassar’s history features discriminatory policies. Until the 1940s, any Black students present at Vassar were accepted unknowingly, having been presumed to be white. 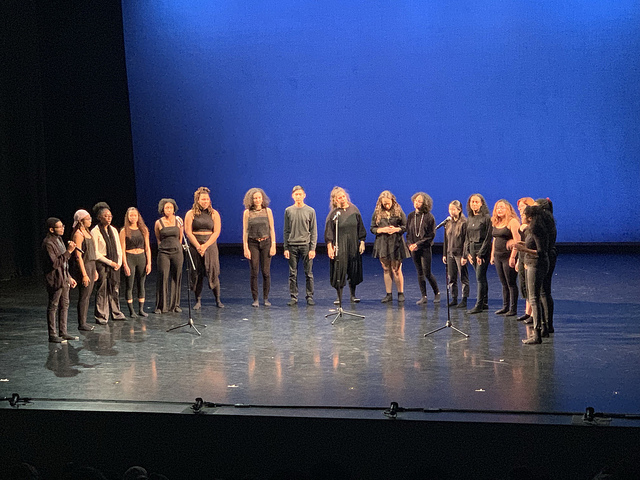 Acknowledging this legacy, the packed event, directed and organized by Savannah Smith ’19, showcased students of colors’ talent to celebrate the progress the college has made in its diversity and recognition of students of color on campus. The Africana Studies Program, which is the longest-running multidisciplinary program at Vassar, was started in 1969 by a group of student activists. “Africana Studies grows out of the student protest movements in the late 1960s, where students across the country formed Black studies programs at the time,” Associate Professor of History and Director of Africana Studies Quincy Mills explained. “Africana Studies at Vassar started in the City of Poughkeepsie, where students were taking a bus from campus to the City of Poughkeepsie to take classes and attend lectures.” These classes took place at the Urban Center for Black Studies. It was only after four years that the program moved to campus, and students no longer had to commute to attend their classes. Vassar’s Africana Studies Program offers over 40 courses, with themes ranging from the political to the artistic, as courses are taught by professors from a variety of disciplines. According to the program’s website, “Its educational mission is to promote a focused and critical study of the people, cultures, and institutions of Africa and the African Diaspora drawing from nearly all of the disciplines at Vassar College” (Africana Studies, “Home,” 01.21.2019). “Freedom: To the 34 Black Women who took over Main Building,” choreographed by Savannah Smith ’19, featured performers Athena Davis ’20 and Abrianna Harris ’21. Courtesy of Monericka Semeran. That the Africana Studies Program is celebrating 50 years at Vassar is no small feat—Anita Florence Hemmings, Class of 1897, was the first Black woman to graduate from Vassar and was only able to do so by passing as white. It was not for another 40 years that Black students were knowingly admitted. Once the Africana Studies Program arrived on campus, its roots in activism and community-engaged learning began to encourage other multidisciplinary programs. “The early innovations of what community and campus could look like comes out of Africana Studies at Vassar, so other multidisciplinary programs that were developed took a look at what Africana Studies was doing and formed around it,” Mills explained. “I would argue that Africana Studies comes out of student activism, and that means there were other areas of study that looked at Black Studies as a model for what community-engaged learning could look like.” Simply put, Vassar’s tradition of community-based learning is forever intertwined with the birth of the Africana Studies program. The anniversary event was eclectic in its showcase of students’ creative pursuits. On the stage of Kenyon Hall, students performed acapella songs, spoken word poetry and dances. Cheers reverberated throughout the packed theater, encouraging and appreciating the talent present. There was a sense of excitement and agreement in the relevance of what the night meant—the performances did not shy away from facing some of the bigger questions about what it means to be a person of color on campus and in today’s society. The show also took a step back to acknowledge the steps Vassar has taken to be more inclusive of various identity groups. The collaboration between a variety of creative endeavors, from heartbreaking spoken word poetry to energetic, uplifting dance performances, offered a wide take on the multifaceted experience of being a person of color.